Ok now that professional basketball season in underway.. I seem to be seeing an increase in “jammed” fingers. Probably just coincidence but when my son jammed his finger playing goalie it prompted me to start thinking about these injuries which do occur when flying spherical objects contact extended fingers as in “ball” sports (basketball, volleyball and soccer). I never fail to cringe when I see a patient who says there finger was jammed and crooked so they (or a teammate) pulled on it to straighten it! While this frequently works (there are a lot of jammed fingers out there that thankfully don’t make it to a surgeon’s office) when it doesn’t it can become a major problem. The joints of the fingers are actually quite complex and in delicate balance. 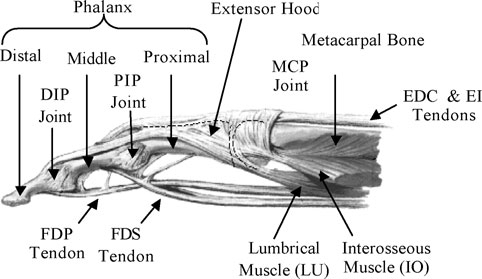 One of the giants of Hand Surgery, J. Littler, called the extensor tendon function a “fugue of motion”, denoting a very complicated interaction of forces each dependent on the other to maintain balance and precise function. Suffice to say that some these structure and certain injury patterns are very benign and heal without problem but others do not. 2. Significant restriction in joint motion that does not improve over a few days. 3. Grating or clicking sensation with motion. 4. Pain that persists and if simple (“popsicle stick” splint) immobilization doesn’t give you relief. 5. Numbness or tingling in the fingertip. By the way, Happy New Year and be careful out there!